Home Autism Would you want your child to be on a national GP autism register? Would you want your child to be on a national GP autism register? 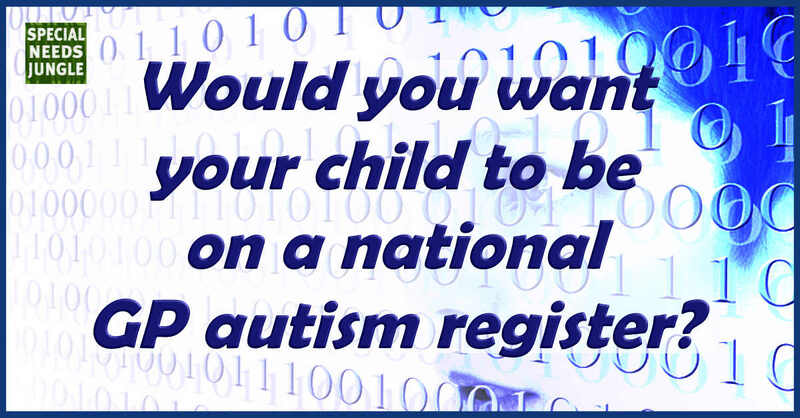 Would you want your autistic child (or yourself if you're autistic) to be on a national autism register? The National Institute for Health and Care Excellence (NICE) says that autistic people will receive better, tailored care if GPs develop a national register. The register will mean patients on the autistic spectrum will be easily identifiable to healthcare professionals working within the GP surgery. This, says NICE, will help the staff to adapt their approach to suit their patient’s needs. Our GP already has patients with autism diagnoses flagged so they get called for flu vaccinations and my sons recently had learning disability assessments (though nothing has come of it so far! ), so I'm not sure how this would change the care they receive in our case. Perhaps though, not all GP practices do this. One of the benefits NICE gives as an example is that surgeries can ensure ASD children are called for vaccinations when the surgery is quieter and could turn down lights for those with sensory problems. However, the needs of individual autistic people, whatever their age, are different, so it seems to me that this could be a fairly blunt tool unless they also take steps to identify what kind of adjustments each person would need. This wouldn't be impossible to achieve, simply by contacting families and noting down the particular needs as an additional note that is brought up when an appointment is being made. In our experience, what would really help is firstly, a record of specific needs as above and an understanding of the different presentations of autism by every medical professional and receptionist. Then, when a parent of an autistic child or the adult themselves makes, or arrives for, an appointment, they can be communicated with appropriately, whether they are seeing their regular GP, the nurse or a locum. This means the parent doesn't have to keep repeating themselves each time and an adult, who may not be "obviously" autistic, can be treated appropriately. 76% said their doctor doesn't make any changes to meet their (or their child’s) needs as an autistic person. 29% of local areas in the Self-Assessment Framework rated themselves ‘green’ for having training available to all staff; a decrease on statistics from 2013 when 38% rated themselves green. Of course, people often need urgent appointments that don't correspond to a weekly time schedule, so if a surgery makes sensory adjustments like low lighting, the waiting room could end up with lights going up and down all morning. However, it could be possible to make the surgery permanently low-sensory as this would benefit more than just people on the spectrum. Individuals with ADHD or mental health problems may also find this beneficial. Having a specific 'low sensory session' or 'additional needs' once a week may be possible for routine appointments. It could also help parents feel more comfortable by avoiding judgey stares from some other patients. GPs could ensure that the doctors with the most interest and additional training in paediatrics or autism for example, could be rostered on for these sessions. Many of us have experienced an unsympathetic GP before now, who made us feel like our children's condition was our fault, or who didn't have the knowledge needed. This doesn't require a national register, just a forward-thinking practice and many already do this kind of thing. However, if the register compelled GPs to comply, then it would be useful in improving national picture of autism in England. NICE says there are around 700,000 autistic people in the UK. Seventy per cent of autistic adults say they do not get enough social service support and one in three will experience a mental health problem. However, although some of the GPs in the pilot felt they should be able to offer a referral to adequate care, others said they would need to improve services for people on the autistic spectrum for the presence of a register to be viable. Most described the services in their area as 'limited with long waiting lists'. So, presumably, they feel that there is little use in knowing the need if nothing can be done about it. However, the Westminster Commission on Autism survey reported that 95% of autistic respondents or their advocates wanted doctors to have a note on their computer screen to tell them that the patient is autistic. This just shows how out of touch with autistic patients' needs some GPs really are, perhaps!  enabling services to make reasonable adjustments for people with autism, providing an identifiable population to assess and measure longer term health outcomes and care process indicators. One of the most mentioned concerns from autism groups in the consultation was around how autism was recorded by GPs, noting that changes in terminology over time means some of the GP 'read codes' were out of date and there is no single code for “autism”. They believe that a new national register offers the opportunity to reform these codes, hence improving the chance of the register being comprehensive. I think that it's a good idea in general, although as I say, this information within practices should be personalised as much as possible so "autistic patients" are not treated as a homogenous whole. However, patients must be reassured in a proactive and accessible way that their data is confidential and any information being transmitted to a national level is fully anonymised. Most importantly, it must not just be an academic exercise. GPs and health bodies must ensure that the data gathered is used to improve both patient experiences and provision of services, other it's a waste of time. What's your view? I asked for an EMIS flag for my own autism to be flagged when i phone up – GP surgery didnt action it for whatever reason. It’s an NHS diagnosis, why is it being hidden? Yes, I would want all 4 of us to have it flagged up when we interact with them, like the epilepsy register, so they know what we might need in the way of reasonable adjustments, not to tell half-truths about things, to give full and honest explanations and be ultra clear about everything they are proposing, etc. It’s not unreasonable. Then they’ll know how to expect Eldest to speak directly to them even though she is a teen and not to get Small started because she will talk endlessly about MLP or Doctor Who, etc. Yes I think it’s great: maybe knowing how many people are autistic will prompt better help, plus I always have to explain Johnny’s needs upfront (and ask for accommodations eg a separate appointment for his flu jab) and this might mean a bit more understanding. I am loud and proud on his autism in general so for me a flag on his medical records is the natural next step. The issue isn’t only having the register, but allowing people to access it. With private diagnoses being challenged, even by GPs, they can pick and choose who they let on their register. Thanks for sharing information on such an important issue. I stumbled across your wonderful write-up after being prompted in my child’s school Rebecca, where they highly stressed upon the cause of Autism. I am very hopeful after seeing your insights and the responses.